Japan may be losing the battle at the Fukushima nuclear power plant after a rise in radiation levels meant attempts to stabilize the situation had to be halted. Early on Thursday, Japanese military helicopters dumped seawater on Unit 3 of the Fukushima power plant in the latest bid to avert a nuclear meltdown, the Japanese news agency Kyodo reported. Tokyo police, meanwhile, are preparing to spray water on the reactor at Unit 4 with water cannons later in the day. Various sources are quoting the head of the US Nuclear Regulatory Commission, Gregory Jaczko, as saying that spent fuel rods at Unit 4 of the Fukushima power plant have been exposed because of a lack of water in their containment pool. This is leading to the emission of a high amount of radiation, he added. Without water to cool them down, Jaczko seemed to imply, the fuel rods will inevitably get hotter and might eventually melt down. Jaczko also added that there may be a crack in the spent fuel pool in Unit 3 of the plant as well, so that pool may be also losing water. Jaczko did not specify how he obtained the information, but the Nuclear Regulatory Commission and US Department of Energy both have experts onsite, AP reported. 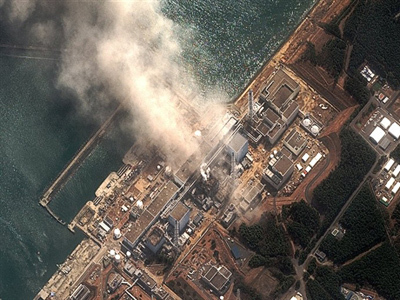 Japanese authorities and the plant operator Tokyo Electric Power Co. have denied the reports. Smoke was seen coming from the the plant on Wednesday, which had already been hit with explosions and fires since Friday's mega-quake . Japanese news agency NHK broadcast pictures of what seemed to be a column of smoke rising from the reactor at Unit 3 of the Fukushima-1 nuclear plant, hours after a fire broke out at the nuclear reactor. Tokyo Electric Power Co suggested it could indicate the water inside the spent fuel pool within the reactor could be boiling. The reactor itself is feared to have cracked. Meanwhile on Wednesday, IAEA Director General Yukiya Amano confirmed that all three functional units at Fukusima 1 are damaged to the core. "The situation at the Fukushima Daiichi nuclear plant is very serious. The damage to the core of the three units, unit 1, 2 and 3, has been confirmed," he was quoted as saying by the Associated Press. "The cores remain uncovered by one or two meters. We do not know the exact situation inside the reactor vessels, but the pressure inside remains above atmospheric pressure. This suggests that they remain likely intact," Amano added. 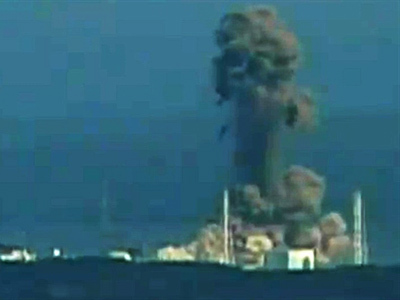 Further operations at the facility were suspended to prevent Fukushima-1 plant from melting down. Due to a surge in radiation, all 50 remaining workers who were dealing with the crisis were withdrawn from the facility on Wednesday, but allowed to return almost an hour later, according to Kyodo news agency. Chief Cabinet Secretary Yukio Edano said the process of cooling the reactors with water was disrupted by the need to pull the workers out. Japan’s Defense Ministry decided to use helicopters and fire trucks to spray water and boric acid to prevent further radiation leaks and to cool down the reactors. But the operation had to be aborted due to high radiation levels over the facility. Japan has requested boric acid from South Korea. Seoul on Wednesday said it would provide 53 tons of the acid, which amounts to almost all the country has, except for a quantity for domestic use. The Kyodo agency has been reporting on the status of the Fukushima-1 reactors. As of Wednesday evening, cooling has failed at reactors 1, 2, and 3. The buildings of the reactors have also been damaged by the series of recent explosions. Seawater was pumped into the reactors to cool them down. Reactor 1’s core is partially melted. The fuel rods in reactor 2 have been fully exposed, temporarily, and therefore even less cooled and its containment vessel is damaged. 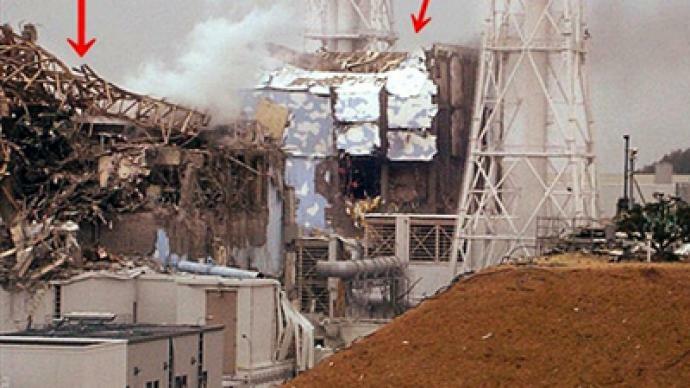 The reactor 3 area revealed high levels of radiation; there are fears that the containment vessel of the reactor and its core may have been damaged and that radiation is leaking out. Potential meltdown is feared at reactor 2. Reactor 4 suffered an explosion at the pool storing spent fuel rods. No water has been poured in to cool the pool and the water level has not been observed. Two fires were seen at the premises on Tuesday and Wednesday. Spraying of boric acid in the reactor facility is being considered, as well as using a water cannon truck to cool the spent nuclear fuel pool. Reactors 5 and 6 have been showing a slight rise in the temperature of the spent fuel pools. Early Wednesday, the level of radiation at the plant surged to 10 millisieverts per hour and then dropped to 8-6 millisieverts. Still, this is at least ten times above average. Japan's Nuclear and Industrial Safety Agency suggests it happened due to a possible radiation leak from reactor 2. Officials reported that 70 per cent of fuel rods at one of the six reactors at Fukushima-1 were significantly damaged in the aftermath of Friday's devastating earthquake and tsunami. The toll is further enlarged by reports of 33 per cent of fuel rods having been damaged at another reactor. An official from Tokyo Electric Power Co. said the worst case scenario would be if the rods became exposed as they can break easily. "Under such circumstances, the radiation material which is normally contained inside the container could seep out of it," he added as cited by the Associated Press. The Nuclear and Industrial Safety Agency says a computer system that forecasts the spread of radioactivity has not been working due to malfunctioning monitoring posts around the Fukushima-1 nuclear plant, reports Japanese broadcaster NHK. The government has ordered some 140,000 people in the vicinity of the plant to stay indoors. But by Wednesday night Chief Cabinet Secretary Yukio Edano stated that radiation 20-30km from the plant posed no immediate health risk. Edano also said that the government has no plans to expand the evacuation area of within 20 kilometers from the plant for now. Japan's science ministry has measured radiation levels of up to 0.33 millisieverts per hour in areas about 20 kilometers northwest of Fukushima-1 nuclear power plant. Experts say exposure to such radiation for several hours would result in absorption of one millisievert, or the maximum considered safe for one year, as reported by Kyodo news agency. In areas 30 to 60 kilometers from the plant the radiation level drops to 0.0253 millisieverts, which is slightly higher than normal. Prime Minister Naoto Kan on Wednesday ordered the measurement of radiation levels at locations across Japan, and called for the provision of accurate information to the public. Japanese Emperor Akihito made a televised address to his disaster-stricken nation on Wednesday. In his appearance, that interrupted the regular coverage, Akihito said the problems at Fukushima power plant were unpredictable and that he was "deeply worried" following the earthquake he described as "unprecedented in scale." "I am deeply hurt by the grievous situation in the affected areas. The number of deceased and missing increases by the day, we cannot know how many victims there will be. My hope is that as many people possible are found safe," Akihito said as cited by Reuters. "Ihope from the bottom of my heart that the people will, hand in hand, treat each other with compassion and overcome these difficult times," he said, urging survivors not to "abandon hope." Japanese Prime Minister Naoto Kan has said 26,000 people have been rescued so far. Relief efforts are being hampered by a shortage of fuel for trucks and ambulances. Japan's health ministry says at least 1.6 million households are still without water after Friday's earthquake and tsunami. The ministry has dispatched 309 water trucks to where people are suffering the most. The water shortages may increase, as communication lines are still down in some of the devastated areas. The number of dead and missing from Friday's disasters has approached the 13,000 mark. 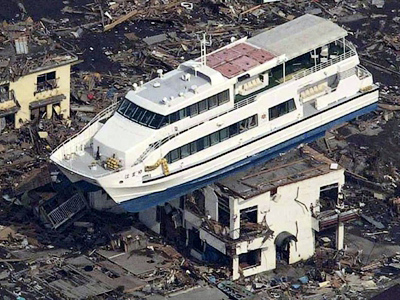 At least 4,314 of them are dead and 8,606 missing, according to Japan’s National Police Agency. In Onagawa Town, which is located on the peninsula, about 5,000 people, or half the population, remain unaccounted for.